With over 25 years of development, CorelDRAW Graphics Suite continues to push the boundaries of what’s possible in visual communication. 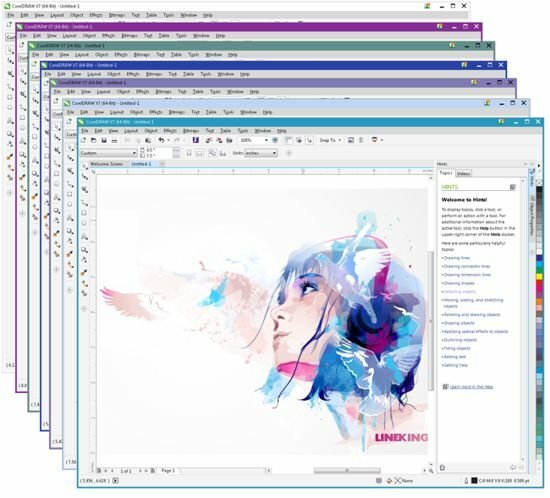 Your usage of CorelDRAW and the amazing designs you produce are a key elements that drives the development of new versions of CorelDRAW Graphics Suite, and version X7 recently introduced is no exception. The vast majority of the new and enhanced features included in X7 are the direct result of your feedback in the community, surveys you’ve answered, active participation from our advisory council and beta testers as well as on-site visits by our team (plus many other sources of feedback). For example, you can now very easily create elliptic and rectangular fountain fills, we added outside and inside outlines, color styles continue to get enhancements and you can also experiment with type using the Font Playground docker. But an even more important theme comes out clearly from the research we do: in addition to having a complete toolbox at your disposal, you also need to be very productive with CorelDRAW Graphics Suite. We know you aren’t paid by the hour for using our software. If you are a graphics professional, you’re most certainly paid by the job you produce. Being able to deliver high-quality graphics your customers expect as quickly as possible enables you to delight them and get more business over your competition. If you’re a small business owner who only uses graphics software occasionally, you need to get the job done quickly but with a high visual quality in order to go back to your business. Being able to turn around the graphics and flyers for a new promotion very quickly enables you to focus on your day job – making your customer happy. Finally, looking ahead, we are committed to listen to your needs and are accelerating our release schedule for updates. Our first update, to be released in June, is a transition into our new rapid releases cadence, with a goal to get as close as possible to quarterly updates (X6 Update 1 one was released in 5-6 months after X6, with X7.1 coming out 3 months after X7) . This new rapid releases schedule will enable us to respond a lot quicker to your requests and continue to improve the CorelDRAW Graphics Suite offering for the years to come. While we are still working on the detailed list of the improvements and enhancements that will come with X7.1 in June 2014, a few of the highlights will include the ability to change window frame colors (see below), the ability to move the status bar to the top, resolving issues saving files to Dropbox hot folders or with “&” in the title and the capability to savefountain fills back to previous versions in a more accurate way. Update 1 will not include any early access to new features for Premium Members and subscribers (we will start releasing these with Update 2 in the second half of the year). This means that anyone with a free Standard Membership will benefit from all these enhancements. And there’s one more thing coming with Update 1 for the third-party developers: We will be introducing a new set of APIs that enable to create add-on tools for CorelDRAW in Visual Basic for Applications or Visual Studio 2012/2013. These APIs allow you to create custom tools that can interact with the drawing window using the mouse, enabling you to create new interactive functionality in a way never possible before. To use an add-on tool, you will need to have signed-in with at least a Standard Membership, which is free to anyone who purchased CorelDRAW Graphics Suite X7. We will have more information about these when the Update is released, and can’t wait to see what our third-party developers will be able to provide. This entry was posted in Graphic design and tagged CorelDRAW Graphics Suite X7, customization, maintenance, multi-monitor, Productivity, Subscription, Update 1, volume license, X7, X7.1. Bookmark the permalink. Corel, though it is a great task to take on, I hope you will expand much more into the Mac/Apple world. It may be time to draw in many small and medium sized customers put off by Adobe’s huge cash flow model, namely Creative Cloud which they are forcing on their customer base. I, for one, am looking for suitable replacements. Thank you for considering this idea.